Now before you think I’m the Grinch, I do get into the xmas spirit. For about 5 minutes. Then I have to keep playing my favorite holiday songs to stay sane. But even daily doses of “Christmas in Jail ”, “Jesus Was a Dreidel Spinner”, “The Night Santa Went Crazy ”, and “Papa Ain’t no Santa Claus and Mama Ain’t no Christmas Tree” sometimes aren’t enough to keep me from wanting to stuff that partridge with French breads, roast it, serve it with a nice side dish of poached pears and shove it down the throat of that little drummer kid. Pa rum pa pa PUM!! “Rare Exports: A Christmas Tale” is a longer version of a pair of short videos made in 2003 by brothers Jalmari and Juuso Helander who both wrote and directed. The videos are definitely worth checking out. You can watch them on youtube or, go to www.chateaugrrr.com/blog/view/399 where you can read the well researched background info about the story. Here comes the spoiler!! The truth is, Santas are wild creatures who must be hunted, captured, tamed and trained to not eat children but to give them toys. To tell you the truth, that is something I have suspected for a long time. The setting is far north Lapland in a small village of people who make their living from the reindeer herds. Rauno and his eight year old son Pietari are getting ready for Christmas while keeping a suspicious eye on the nearby mountain, Korvatunturi. It is being excavated by a team hired by a rich American who has his boyish heart set on finding Santa Claus. He has a hunch the mountain is actually a burial mound. He is almost right. They uncover something all right, but it’s a lot closer to Old Nick than Old St. Nick. Pietari turns out to be a sort of pre-pubescent Professor Van Helsing who knows what is really going on and tries to warn his father and everyone else before it’s too late. 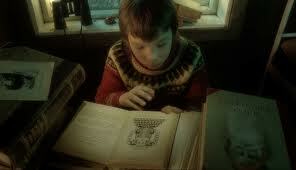 In a charming and amusing scene we see our little hero pouring over ancient texts about the real Father Christmas. 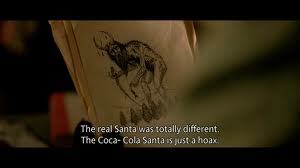 These histories reveal that he was not the “Coca-Cola Santa” we are familiar with, nor any kind of right jolly old elf. In reality he was a pre-historic horned demon who was particularly harsh to the naughty children - he boiled them in a cauldron and ate them. That makes a piece of coal in your stocking sound pretty good, doesn’t it? Santa’s reign of terror was halted eons ago by the locals who trapped him in a lake of ice and piled a mountain on top of him. Bizarre and frightening things start happening around the village. The reindeer herd is found slaughtered, and things start disappearing - ovens, space heaters, curling irons, not to mention a few of the children. When Rauno, Pietari and their friends check out the excavation they find it deserted and an enormous blasted out cavern left behind. Then things really start to get weird. Rauno and Pietari set a trap and capture what appears to be a mute, feral, dirty naked old man with a long filthy white beard. When he gets a whiff of a child standing nearby he gets a very lean and hungry look, sort of like a wolf staring at a bunny. One of the villagers gets a little too close and loses part of an ear. 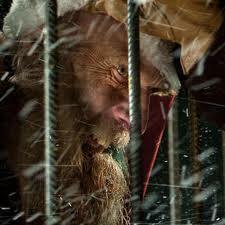 The captive is only one of about two hundred nasty, gnarly wild old men who are in reality Santa’s “elves”. You won’t find these guys scampering about wearing cute furry caps and little slippers with bells on the toes. You certainly won’t find them working in any kind of toy shop -an abattoir maybe. Pietari finally convinces the men of the truth and comes up with a highly ingenious but dangerous plan to get rid of Demon Claus and round up the elves. Not to mention that this leads to the profitable company they christen Rare Exports. Pietari and his father Rauno are played by real life father and son, Jorma and Onni Tommila. All of the cast are very good, but little Onni is particularly appealing and natural as Pietari. The movie has a lovely, other worldly look to it. It kept reminding me of “Edward Scissorhands” with it’s almost real/fairly tale quality. The special effects are pretty low key and must have been fairly inexpensive but are impressive for all that. The script does just about all it can to stretch out the premise from short video to feature length without becoming dull or repetitive. So, for all of us who think the name “Santa” is misspelled, for all of us who want to tackle that bell-ringer outside the supermarket and ram that clanging noisemaker between his eyes, for all of us who don’t think it absolutely necessary to jingle ALL the way - this is our movie.